Sergey Mikhaylovich Brin is a Soviet-born American computer scientist, internet entrepreneur, and philanthropist. Together with Larry Page, he co-founded Google. Brin is the President of Google's parent company Alphabet Inc. In October 2016 , Brin was the 12th richest person in the world, with an estimated net worth of US$39.2 billion. 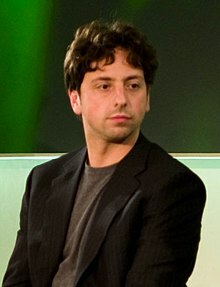 Sergey Mikhaylovich Brin (Russian: Серге́й Миха́йлович Брин; born August 21, 1973) is a Soviet-born American computer scientist, internet entrepreneur, and philanthropist. Together with Larry Page, he co-founded Google. Brin is the President of Google's parent company Alphabet Inc. In October 2016 (the most recent period for which figures are available), Brin was the 12th richest person in the world, with an estimated net worth of US$39.2 billion. Brin immigrated to the United States with his family from the Soviet Union at the age of 6. He earned his bachelor's degree at the University of Maryland, following in his father's and grandfather's footsteps by studying mathematics, as well as computer science. After graduation, he moved to Stanford University to acquire a PhD in computer science. There he met Page, with whom he later became friends. They crammed their dormitory room with inexpensive computers and applied Brin's data mining system to build a web search engine. The program became popular at Stanford, and they suspended their PhD studies to start up Google in a rented garage. The Economist referred to Brin as an "Enlightenment Man", and as someone who believes that "knowledge is always good, and certainly always better than ignorance", a philosophy that is summed up by Google's mission statement, "Organize the world's information and make it universally accessible and useful," and unofficial motto, "Don't be evil".